Naturally Assists in Elimination of the the heavy waste build up in the intestinal tract. 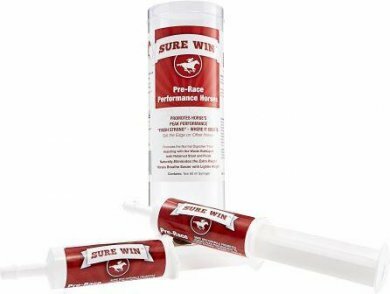 Sure Win is a Pre-Race formula for Performance Horses. Promotes Horse's Peak Performance. "FINISH STRONG" WHERE IT COUNTS! Get the Edge on Other Horses. Promotes the Normal Digestive "Flow" assisting with the waste buildup of both retained stool and fluids. Naturally eliminates the Extra Weight. Horses Breathe Easier with Lighter Weight. Feeding Directions: Give by mouth (orally) two 60 ml syringes 6 - 8 hours before race. **Use in accordance with event rules which govern the use of all products and the timing when they may be used. Feeding Directions: Give by mouth (orally) two 60 ml syringes 6 - 8 hours before race. Use in accordance with event rules which govern the use of all products and the timing when they may be used.